Our goal is to provide a simple user experience and lightning fast, secure hosting with great customer service. In addition, we pre-install all our premium WordPress themes plus a curated selection of well-designed free themes from WordPress.org. New themes are added to our lineup on an ongoing basis. One might call it Themes-as-a-Service. A super-fast WordPress website means a better user experience. Bad web hosts can make our themes appear slow but in most cases it is a shared hosting platform that is causing a problem, not our code. We want to ensure users have a positive experience with not just our themes, but WordPress as well. Offering a great option for hosting means an improved overall experience. In terms of benchmarking, UpThemes Hosting is extremely fast and rivals the performance of other managed WordPress hosts on the market. We’ve run tests against our platform and have seen it outperform standard shared hosting plans by nearly 25x. two Nginx front ends and one vanilla WordPress site served with PHP-FPM. We sent ~26,000 requests over 60 seconds with a linear increase in concurrency as the test was performed. The following chart shows the average and maximum number of requests that were served during this test. A higher number of requests served is better for this test. This chart shows the average and maximum hits per second for each WordPress site. Our infrastructure can handle up to 74.2 millions hits per day compared to the standard shared hosting’s maximum of just 2.9 million. As you can see from the chart, UpThemes Hosting could handle nearly 25 times the traffic of the competition. Shown in the chart below, the response times for UpThemes Hosting were much faster, coming in at 151ms (average) and 256ms (slowest). The shared hosting server didn’t come close to that, averaging a 710ms response time with a slowest response of 1065ms (shorter times are better here). 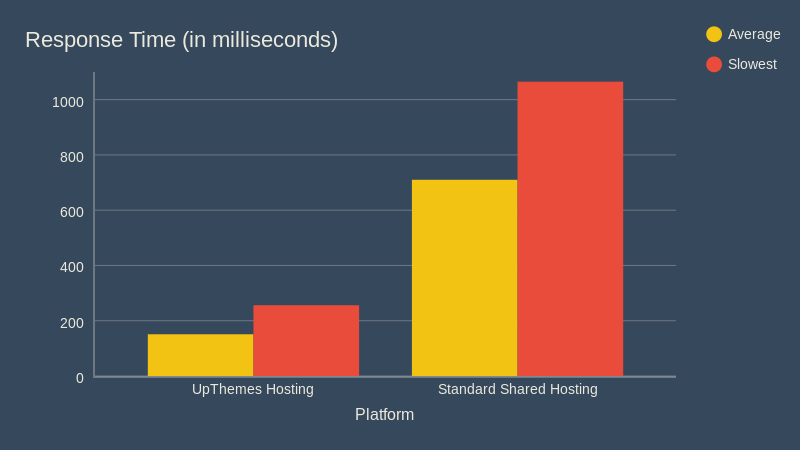 The slowest response time for UpThemes Hosting was less than half the average response time for the shared host tests. While running these tests, we also measured the error rate, which is the number of requests that failed to be served. For UpThemes Hosting, only 0.01% of all requests during the test failed. The standard shared hosting resulted in 99.1% of these requests failing. That means almost 100% of requests were successful for UpThemes Hosting. Your site could get mentioned by Oprah and not only stay up, but serve 99.99% of the requests during those extremely high traffic times. 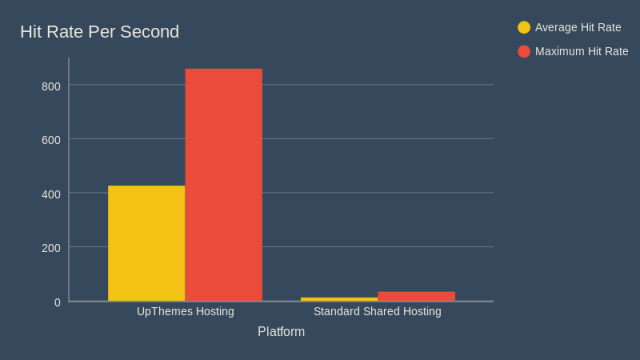 While we still try work hard to optimize the setup time of our WordPress themes for all other web hosts, UpThemes Hosting is by far the easiest way for customers to get up and running. We want to streamline the amount of steps and time it takes to install, activate, and configure our themes and our customers often wish the whole process were simpler. Users should need help very rarely. Our goal is empowering non-technical users to create content online. Providing a seamless theme installation and setup process means we can often eliminate questions like, “How do I download the theme?” and “Where do I upload the theme file?” By skipping the theme installation step, users can focus on creating their content rather than simply installing everything. This makes our interaction with customers more valuable to them and simultaneously reduces our support burden. Our themes are tested and guaranteed to work well on our own hosting platform. Many of the issues we come across with customers are environment-related, usually related to something their host has disabled or a pre-historic version of PHP installed. 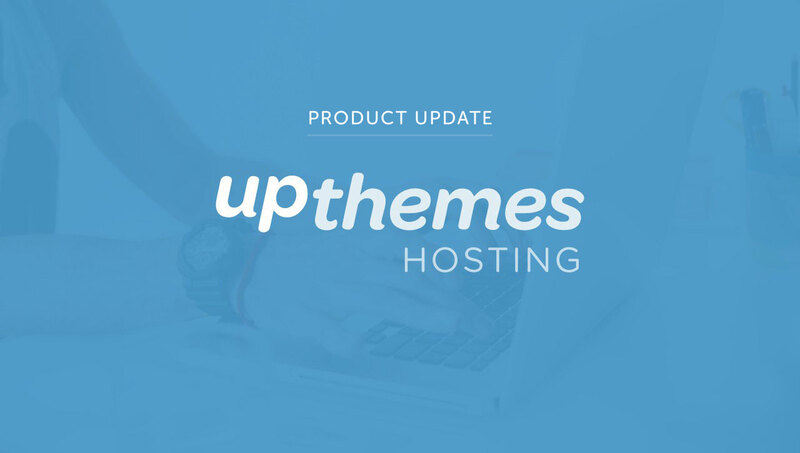 With UpThemes Hosting, we can ensure that all themes work all the time for all customers. We just recently launched two new programs that customers have long asked for. Number one is our brand new affiliate program through Share-a-Sale. We were using AffiliateWP for quite a while and were quite happy with it, but Share-a-Sale offers great visibility and an easy-to-setup tracking system that has been applied to both our theme checkout and hosting packages as well. Any referrals that go through Share-a-Sale links will be tracked and pay out 30% per theme sale or a $50 flat fee for hosting signups. To become an affiliate, sign up here. The second program is our new Reseller Program. This program is perfect for agencies wanting to offer fast, secure hosting along with 40+ super clean WordPress themes. Resellers can add their own branding, provide a high-value service to customers, earn recurring revenue, and spend less time supporting customers. It’s a win-win situation. To become a reseller or learn more, please contact us for more information. As you can see below, we’ve updated our plans with a few really great options for pro bloggers, agencies, and small businesses. Each plan scales up in both resources and number of WordPress sites, from 1 to 5 to 10 to even 25 sites! For our top tier plan, you can now get 25 sites for less than $8/mo. per site and they all get access to 40+ curated themes valued at over $750. These plans are available now and are all eligible for our affiliate and reseller programs. 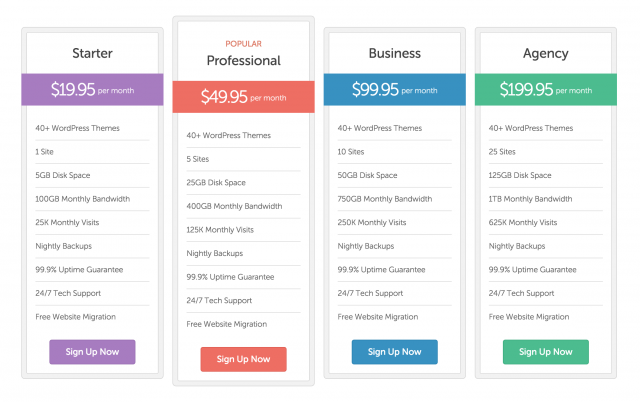 It’s really a great news that UpThemes hosting offers one month free trial. I will try this very soon.